Commander Eric Tufnell RN (1888-1979). 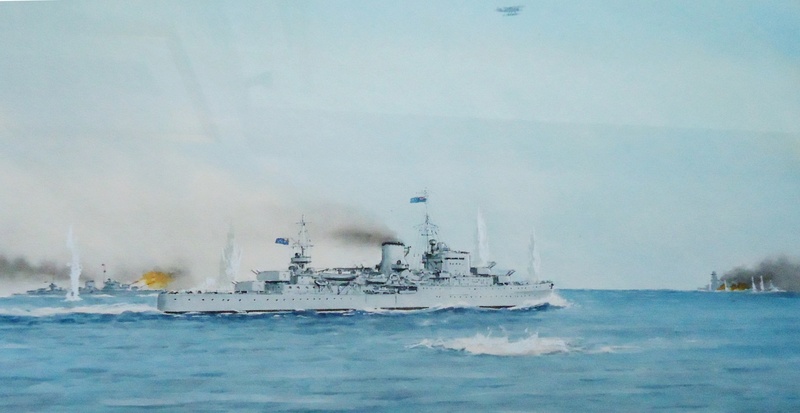 Original watercolour signed E Tufnell (LR) and annotated River Plate Action 0730 13/12/39 (LL). The cruiser has been at action stations now for a while; all boilers are connected and the engineers are working up to full power. Battle ensigns have been broken out and the spotter plane is up; on the port beam is HMS AJAX, EXETER is out on the port bow trying to draw GRAF SPEE's fire and the German is beginning the first and last fight of her life..... Having closed the range a bit more the captain will shortly be bringing ACHILLES to starboard so that her after turrets can bear. A superb painting by Tuffy!